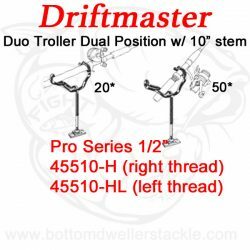 View cart “Driftmaster Pro Series Duo Rod Holders 455-H – 8 pack deal” has been added to your cart. 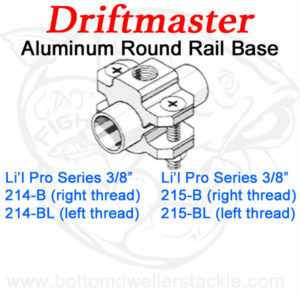 Two Models available for either 7/8″ or 1″ round rails. Rod Angle can easily be adjusted by loosening one nut and turning base on rail. 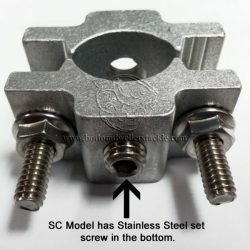 Round Rail Clamp Base for 3/8″ stem rod holders. 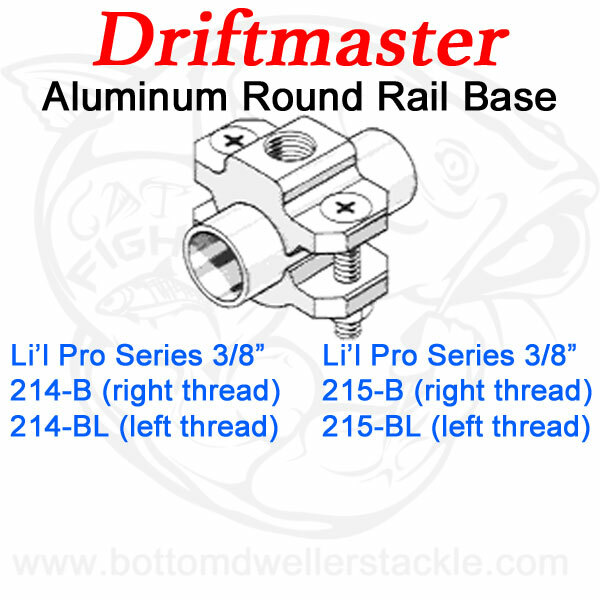 Bottom Dwellers Tackle continues to offer the most popular products that our customers have asked for over the years. 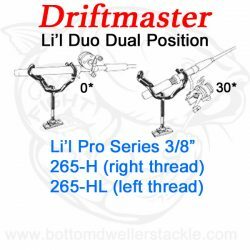 We also continue to bring you the newest products for the catfish market such as Driftmaster Li’l Pro Series Rod Holder Bases 214-B 214-BL 215-B and 215-BL Round Rail. Our product offerings have been built on our customers recommendations and by our knowledge of the products that our customers use, as well as from our years of using these products. 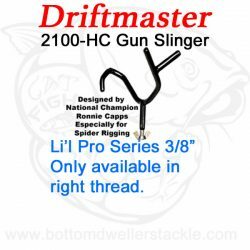 Specializing in trophy catfish gear and tackle for the serious tournament fisherman or the weekend angler. Cat fishing is what we do, it’s our business and our passion. We are always willing to add quality products to our offering if there is a demand and we can offer them at a competitive price. We cover all the big game out there; Blue catfish, Flathead catfish, Channel catfish, Alligator gar, light saltwater, and any other big game you are out to catch! 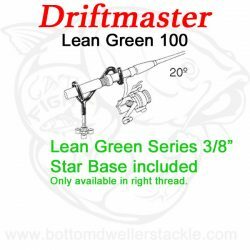 Browse the Bottom Dwellers Tackle shop and let us know what we can do to help! Item #’s ending in “L” are left-hand thread (examples = 255-HL or 200-BL). 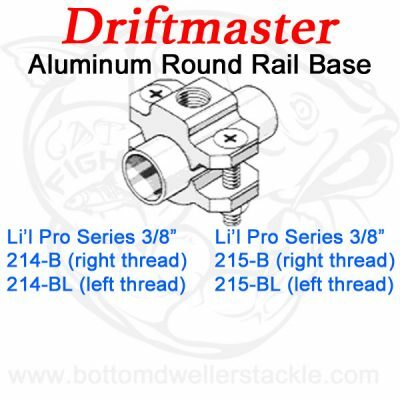 Right-hand thread items are for use on the right side of the boat and left-hand thread products are for use on the left side of the boat. Why do we offer the option of right or left-threads? 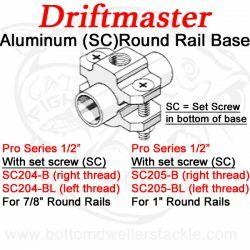 As rigs are pulled toward the rear of the boat (either casted or being trolled) You want to keep the pressure always tightening the threads. 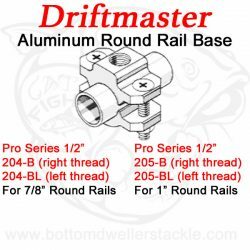 If a rod holder were to not be completely tightened during installation, the pressure could loosen right-hand threads if installed on the left side of the boat (if not tightened properly). 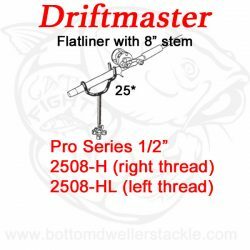 Using left-thread on the left side of the boat means the rod holder is being tightened as it is pulled toward the rear of the boat. Right-hand threads install and tighten clockwise, left-hand threads install and tighten counter clockwise. Using the correct right-hand and left-hand products are important for applications in which the rod holders will be removed from the mount frequently, which can lead to them accidentally not being tightened properly upon reinstallation. Note: Right-hand thread rod holder require right-thread bases, Left-thread rod holders require left-thread bases. Please don’t hesitate to contact us with any questions you may have. We will be happy to help you in rigging your boat and getting you the right products to do it right for your needs. 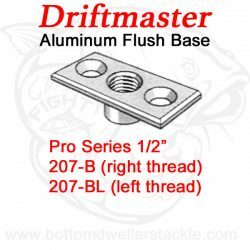 Remember all Driftmaster rod holders are made in the USA and guaranteed for life against breakage! You will not break these rod holders! 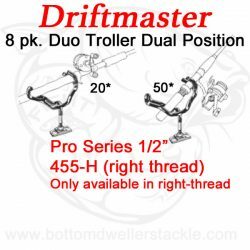 Driftmaster, You Fight The Fish, Not The Rod Holder! The harder a fish pulls, the tighter the rod is held. There is never any slack line … just remove the rod from the holder by lifting the rod tip … the hook is set instantly and automatically.